I am consistently accurate when judging distance. However, things don’t always go as planned. I remember on one hunt I had fallen asleep in my tree stand. I awoke to the cracking of branches and the rustling of leaves. Before me was a nice eight point white tail. I drew back and loosed an arrow. Still being a little groggy, I had made a big error in my shooting solution. The arrow flew over his back, and he bounded off. Sitting there in disbelief, I figured out what went wrong. My aim was true, but I used the wrong pin on my sight….. I had misjudged the range. How could this happen? When I set up for the day’s hunt I used a laser range finder to tag specific trees, rocks, and brush to serve as markers. To check my estimates I ranged the objects again. The values were correct so it wasn’t a range finder malfunction, and then I realized that I had forgotten the previous values. I had taken a thirty yard shot with the forty yard pin, which resulted in the high shot. Thinking back to this, I am glad I found the product that I will be reviewing in this article. The Dead-On Range Finder is what I believe to be a great solution to the need for fast and accurate range values, without having to retrieve any gear from your pack, vest, or pocket. 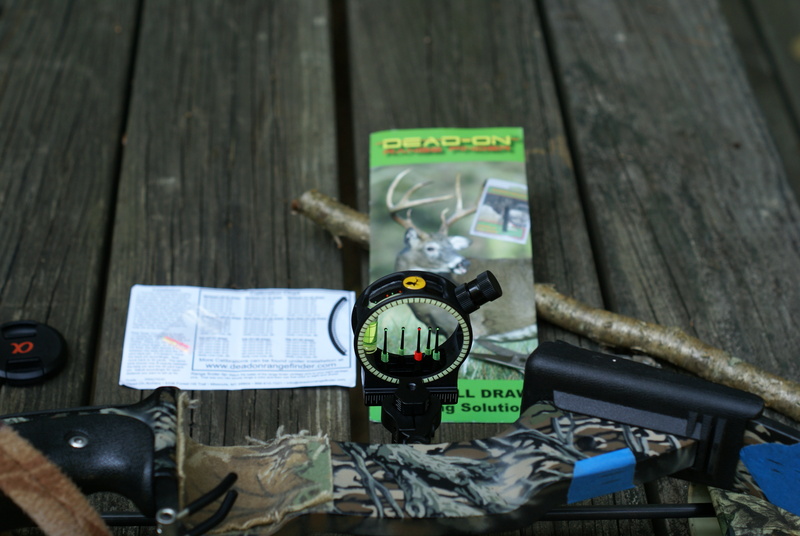 This product would be the difference between a shot that misses and a hit if you were hunting on the ground, or in a tree stand. 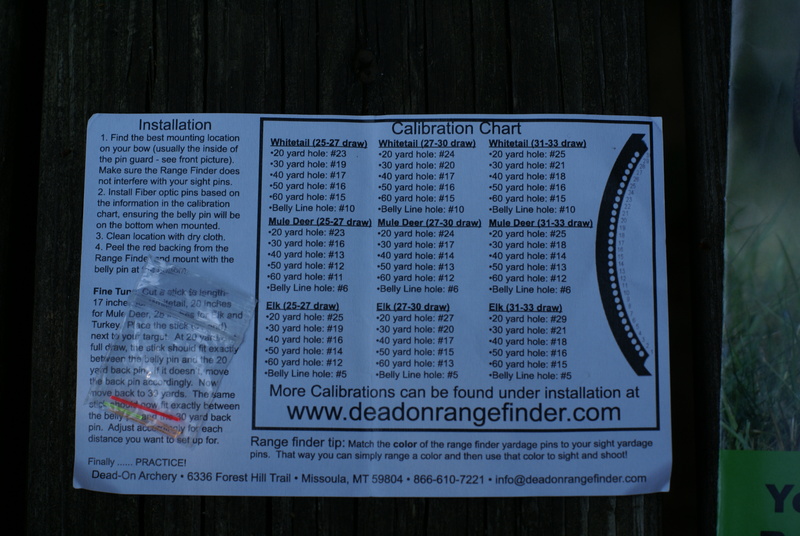 The Dead-on Range Finder is a simple device to install, calibrate, and use. Another positive for this product is that it only costs about $20. To start, be sure that your bow is sighted in at known distances for where you will be hunting from (ground or tree stand due to the gravitational effects on an arrow’s flight). Having done that, you are ready to install. All you need to do is clean the area of the sight you plan to mount the fixture on (usually the left inside surface), remove the backing strip, and apply. The inserts that come with the system are fiber optic (green, yellow, red) and are easily cut to size. I started by inserting six into the mounted base, with one of those being at the lowest position to serve as the “belly line” marker. Reading through the insert I found a lot of information regarding where to set the pins to begin calibration. They are organized by type of game, draw weight, and show what hole the inserts go into. To fine tune the pins, a life-size target or an object cut to the prescribed size is used (ends serve as the belly line, and back line of the animal). More back to belly measurements can be found on their website under “calibration guides”, and all measurements reference the average sizes of the animals. Since I will be hunting white tail, a 17 inch tall target was used. At the twenty yard line I came to a full draw, and compared the space between the bottom insert and the twenty yard insert to see if they matched up with the top and bottom of the 17 inch target. 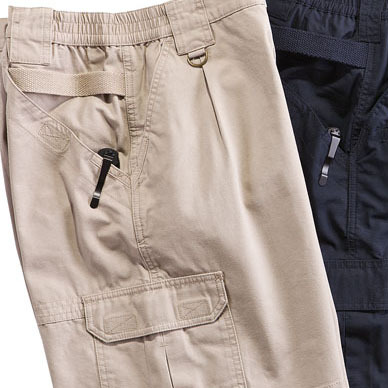 After a slight adjustment (your experience may vary), the inserts lined up perfectly. Repeating this process, I calibrated from ten to fifty yards in ten yard increments. If the animal’s silhouette is between the inserts, I know that it’s and additional five yards away. In regards to what colors to use at what range, that’s up to you. I personally prefer to use the colors to denote different distances, even though they don’t match the colors on my pins. 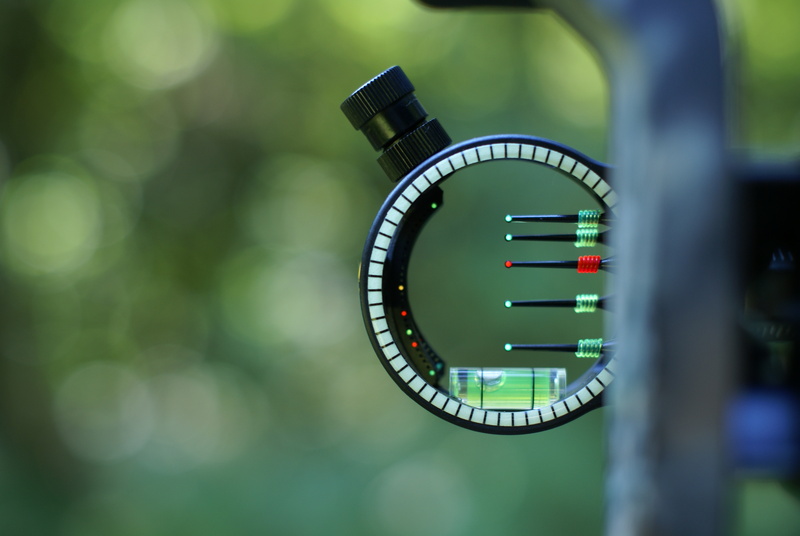 If you have multiple color pins on your sight, this option may work well for you as it gives you a color coded reference of distance. The Dead-on Range Finder mounts inside of the bow sight. Here, you can see it through the side of my sight. 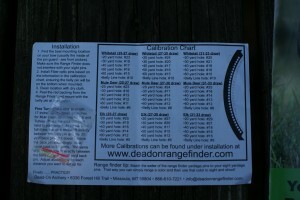 The insert contains some calibration information, and you can find more on their website. 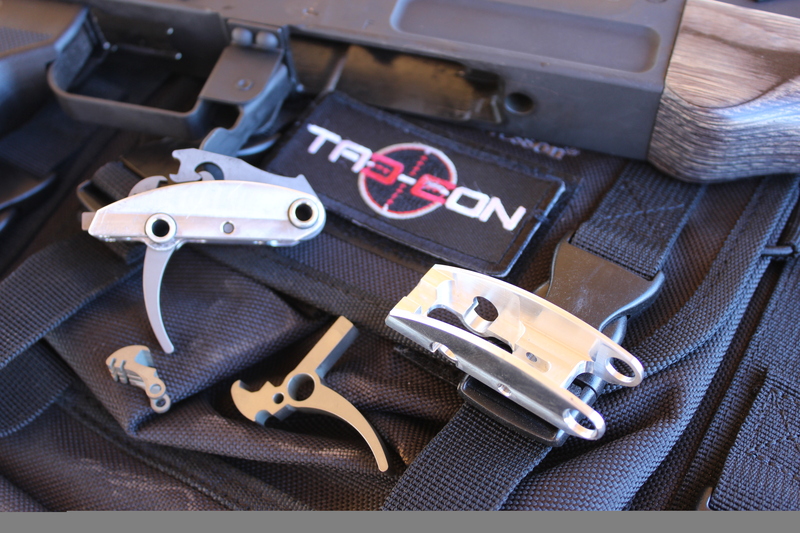 This product comes with three different colors, and can be used to match the colors of your sight pins. While the insert colors don’t match the pins, I arranged them this way for the fast recognition of distance. This product works great at an even or elevated position from the game. How it works with both is; the animal is a three-dimensional target. Keeping this in mind, your view wraps over the back of it as your view of the belly diminishes, keeping the average size measurement similar. The result is an accurate range estimation by means of line-of-sight. This is important in a terrain where the elevation may change. Just remember that your arrow will fly different due to the angle of the shot. If you’re ground stalking, you may only have a few seconds to loose an arrow when you come across game, or it comes across you. This product reduces (just about eliminates) the chances of a shot going too high or low, due to an incorrect ranging. I have found that with regular practice (using the average belly to back height) at unknown distances, using the Dead-on Rangefinder becomes second nature. At the time of this article there have been about one hundred arrows loosed from my bow, and I haven’t had any issues with the inserts coming out or the range finder detaching from my sight. This is an outstanding product designed by bow hunters for bow hunters. 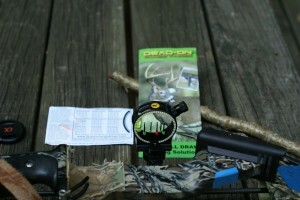 The fall season is coming up fast, and I’m looking forward to putting the Dead-on Range Finder to good use. 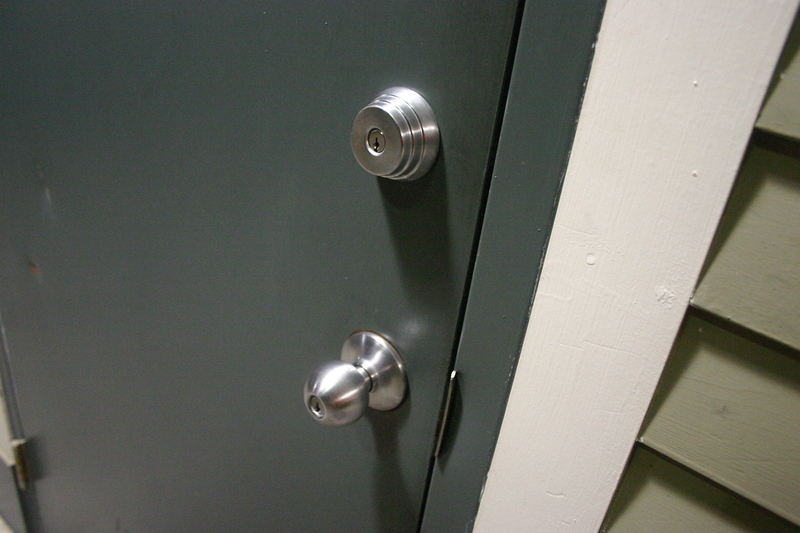 Your Front Door, Concealment or Cover?